“Richard was my first and most important mentor….he wasn’t didactic, he didn’t have rules or nostrums to follow….he just had beautiful taste and the impulse and maybe the courage to keep things simple….he taught me to strip things away instead of adding things on….fewer words, fewer frames, made a good idea clearer, better….if you look at his body of work his voice is so apparent: elegant, witty, laconic…the work is so strong and doesn’t look like anything else….it’s very much of its time, but is timeless…Richard understood the power of type on screen; with the simplest gestures he let the letters themselves tell the story….look at his work on Alien, Altered States, Blow Out, The Untouchables….consistent, original, rigorous, and so simple….brave, you might say….i will miss him a lot"
"Richard's masterful design aesthetic reflects the way he lived life - thoughtful, simple, entertaining, and often with a touch of whimsy. He has been a major influence on today's generation of designers and storytellers." "I was lucky to be able to work with Richard at RGA/LA-- when I arrived, I was only a year out of college, fresh to the world of cinema and design. Richard’s work was a true merger of both. Who could forget the blue letters of zooming light that opened Superman? 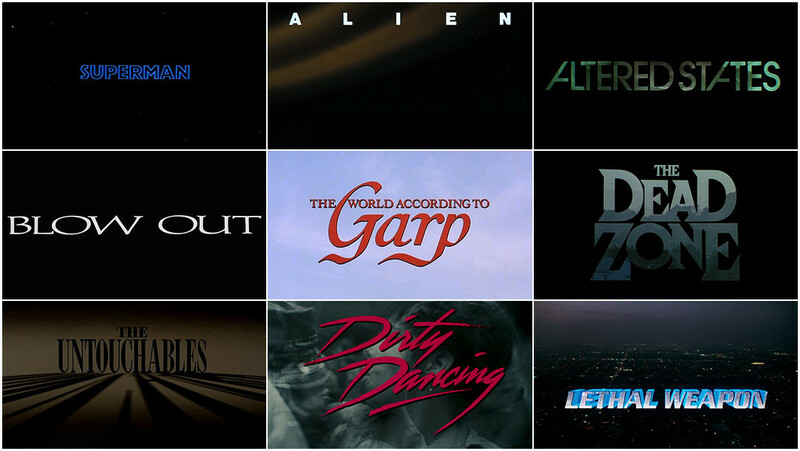 Or the huge windows of type that slide across each other in Altered States? Even now, I’ll go to a meeting for a new show or film, and sure enough, the slow build of the Alien title will be referenced, held up as an example of how strong, how iconic, how memorable the synthesis of type and image can be." "Richard Greenberg’s work, which encompasses both simplicity and thought provoking messages, has been a major influence on me and many designers. The spirit of his work, that elegance and understatement will remain in our collective consciousness."